So How Does That Personal Hotspot Feature Work? "It's a good thing that I decided to sign up for AT&T's implementation of the iOS 4.3 Personal Hotspot feature while I was standing in line for my iPad 2 a couple of weeks ago." It cost him $45.00 USD extra per month but he is pretty happy with it, and from what he has written the process is pretty easy. 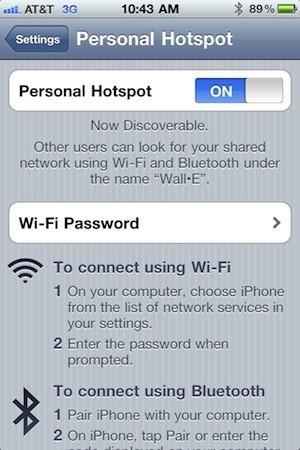 How about you, have you signed up for the Personal Hotspot option, and if so, what are your thoughts on it? I'm still hesitant about letting go of my unlimited data plan, but as I monitor my usage I'm finding that I don't even approach the 2GB limit on the plan that is required for the Personal Hotspot option.